Kedarkantha, situated in the Tons river valley of the Garhwal Himalayas is a beautiful ridge peak, easily accessible anytime of the year. The trek goes through the Govind National Park and gives you ample time to soak in the flora and fauna of this protected area. The summit lies at an altitude of 3850 m and reaching the top is very satisfying as you are rewarded with views of peaks like the Swargarohini, Banderpooch, Kalanag and Ranglana. 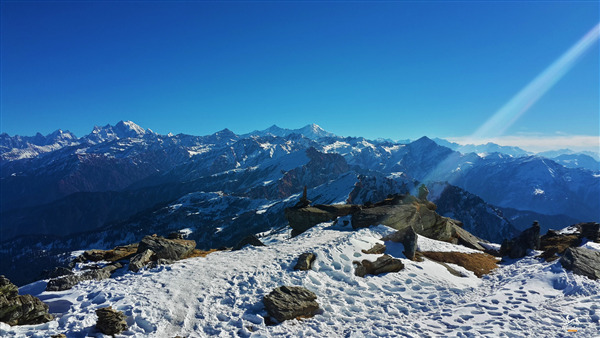 The beauty of the trek, especially during winter is unsurpassed with views that are completely blissful to witness. If you are a group and would like to take the trek on any date other than the fixed departure dates, then kindy contact us with your dates. Customized programmes for groups can be arranged as per requirement. CUSTOM DATES AVAILABLE DECEMBER 2018 TO MARCH 2019 If you are a group OR an individual and would like to take the trek on any date between December 2018 upto February 2019, then kindly contact us with your dates. We will start early from Dehradun and drive to the beautiful village of Sankri. Early evening arrival at Sankri, check into guest house/hotel. Trek briefing before dinner, overnight at guest house. Day 2: Post early breakfast we will start on a 4 km trek to our campsite at Juda Talab. The trail spreads through the Saud village and is a gentle climb through pine forests and maple trees. Dinner and overnight stay in tents by the lake. Today we trek @ 5 km from Juda Talab to the Kedarkantha base Camp. The trail leads through pine and oak trees and opens out onto a sprawling meadow below the Kedarkantha summit. Gorgeous views of snow capped ranges can be enjoyed from here. Day 4: Post early breakfast we start for the ascent to Kedarkantha Peak (3850 m) The views are breath-taking from here especially towards Himachal.Later, we will descend back to the base camp. Overnight in tents. Day 5: After a leisure morning we descend down to Sankri. We shall be trekking @ 8 kms. The trek once again takes you through the dense pine forests. Overnight at Sankri in guest house / hotel. Please fill up the registration form and pay an advance of Rs.5000/- to confirm your booking. The balance payment should reach our office at least 30 days before the commencement of the journey. *Accommodation in standard rooms in Hotel / Guest House at Sankri and tents during the trek on twin / three sharing basis. *To and fro transportation from Dehradun to Sankri and back. *All vegetarian meals starting from day 1 dinner to day 7 breakfast. We provide hot breakfast and hot dinner. On trekking days packed lunch will be provided. *Professionally trained and experienced guides and kitchen staff would accompany the group. *Forest entry charges, permits and camping fee. *Alcohol, soft drinks, beverages, etc. *Personal expenses like tips, telephone calls, laundry etc. *Any costs arising out of unforeseen circumstances like landslides, road blocks, bad weather etc. Any other cost not mentioned in the inclusions. Jain food will be provided on demand as per availability . No refund will be given in case the participant terminates the programme at any point due to any reason. Please do not bring valuables in the programme. It will be participant's duty to take care of their own luggage. Company is not liable for any kind of theft, loss or damage to your luggage. At any point during the programme if any damage is done to the hotel property or bus or at any other point knowingly or unknowingly by any participant the responsible participant will have to bear the total damage charges and will have to settle it on the spot. In case of the cancellation of the programme, actual amount paid by the participant towards the trip will be refunded by A/c payee cheque only. No other claims will be entertained. The Company reserves the unconditional right to refuse a booking/terminate a passenger on programme in event of unreasonable behaviour at any time. In case if the programme days increases due to any unforeseen circumstances, the participants will have to pay Rs.900/- per head per day in cash to the programme manager. In case if the programme is cancelled or abandoned due to any unforeseen circumstances, no refund would be given. Any claim or complaint by the passenger must be notified to the Company in writing within ten days after the programme completion date. No claim notified to the Company outside this period will be entertained and the Company shall incur no liability in respect thereof. If the passenger has any complaint in respect of services provided by any of the independent contractors, the passenger shall immediately notify the same to the independent contractor and a copy thereof should be handed over to the programme manager, to enable the Company to take up the matter with the independent contractor. The signing of the booking form by the passengers shall mean acceptance in totality of the ‘Terms and Conditions’ contained herein by the passengers. In case of one or more, but not all passengers signing the ‘Booking Form’, it shall be deemed that the others have duly authorized the concerned signing passenger.